The main goal of a wing is to create a force that is equal to the weight of the aircraft but pointing in the opposite direction, so the thrust of the wing can lift the aircraft's weight. 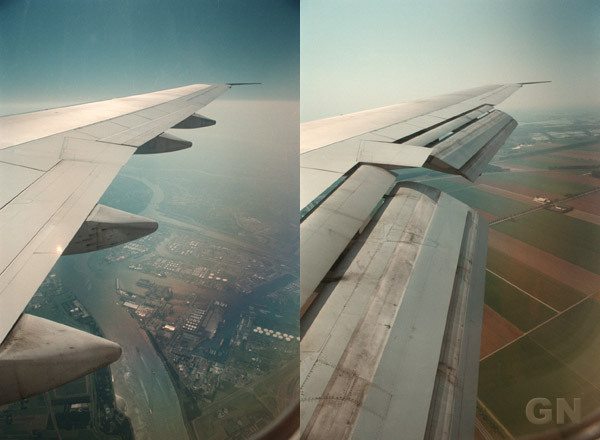 A wing flying through air reduces the air pressure above the wing a lot and increases the pressure under the wing a bit. How on earth is it possible for a Boeing 747 to take off in the air? It weighs tons! The most important to realize here, is the pressure of the air surrounding us. We live, without realizing it, in a part of space with highly pressurized air; the atmosphere, which is a thin layer around the Earth. The pressure at sea level is normally about 1 kgf (kilogram-force) per square centimeter, that is about 10.000 kgf per square meter! Reducing the pressure above 1 square meter wing 20%, will reduce the pressure force from 10000 kgf down to 8000 kgf. If the pressure at the bottom of the wing is 10% more, thus 11000 kgf, the wing's thrust is a force upwards of 11000-8000 = 3000 kgf. If the wing is big enough, it can lift a heavy craft. But how does a wing alter the pressure of the air? "Because the top of the wing is curved and the bottom is flat, the distance on top is longer and therefore the air on top has to go faster. Fast air has less pressure, thus the slower air on the bottom pushes the wing up"
- Air doesn't have to go faster because of a longer path, there is no law in nature that states that air volumes have to reunite after being separated. In fact: the air doesn't reunite at the trailing edge of a wing. - There is no such thing as fast air. Speed is a relative thing, not a property of mass. Speed is a measure of how quickly the distance between two objects changes. A wing flying up side down can produce upward thrust to lift the craft! Before looking at real wings airfoils, first some information about how solid objects move through a space filled with pressurized the gas (air). The mass of air is not much, but maybe more than you'd expect. On the surface of the Earth it weighs about 1.2 kg per cubic meter. The atmosphere is a relatively thin layer around the Earth, but still some 100 kilometers thick. The further away from the surface of the Earth, towards space, the thinner the air becomes, until pretty soon there is no air at all. It is gravity that keeps the air around the Earth. It is also gravity that pressurises the air at the surface so much, because of all air above it, all being 'pulled' towards the Earth. Imagine a solid cube surrounded by air. When this cube moves from its position (A) to a position next to its first position (B), what happens in the surrounding space filled with pressurized air? At first there was air at position B, but now the cube is there, so that volume of air had to move away. When the cube moved from position A to B, it left a void behind, an area of space empty of atoms. Because the air is pressurized, the void gets quickly filled with air, quickly -not instantly. Air has mass, and mass will resist against acceleration (against faster ánd slower, which are equal anyhow). During this transfer from position A to B, air is being accelerated away from position A, by the cube, and air is being accelerated into position B, by the pressure of the surrounding air. Then the air doesn't just simply stop, because that would be an other acceleration. The motions become turbulent though, chaotic, the energy spreads to wherever it can. During the transfer from position A to B, there is an (gentle) explosion in front of the cube, and an (gentle) implosion behind it. An explosive area has higher air pressure, and an implosive area has lower air pressure. Information about airpressure travels through air with the speed of sound, so the exploding area "knows" about the imploding area, and wants to go there. The surrounding air "doesn't want" to accelerate (because it has mass). But the cube is a very airflow unfriendly shape, so it becomes a turbulent mess. The result is higher pressure in front of the object, lower pressure behind it, and a lot of "drag", energy loss by turbulence. While the goal is: lower pressure on top, higher pressure on the bottom, and no energy lost to drag. Sounds are pressure waves traveling through the air with 343.2 metres per second, or 1,236 kilometres per hour (in standard air at sea level). When an object moves through air slowly, it's not true that the air begins to move only as it touches the object. Truth is that the information about changing air pressure travels around which the speed of sound. When moving an object forward, the air at 343.2 metres in front of it, knows about that in 1 second, and will react on that. Nearing the sound barrier is when the object moves forward almost as fast as its pressure wave. Most aircraft fly subsonic, meaning slower than the speed of sound. Some aircraft can go through the sound barrier, supersonic, where their speed relative to the surrounding air is higher than the speed of sound, faster than its pressure wave. The aerodynamics of supersonic flight is a whole different chapter, this page is only about subsonic flight. First thing to do, after understanding the cube, is to make the shape of the object air-friendly, give it an aerodynamic airfoil, so that the air will give as little as possible resistance to the object moving through it's space. 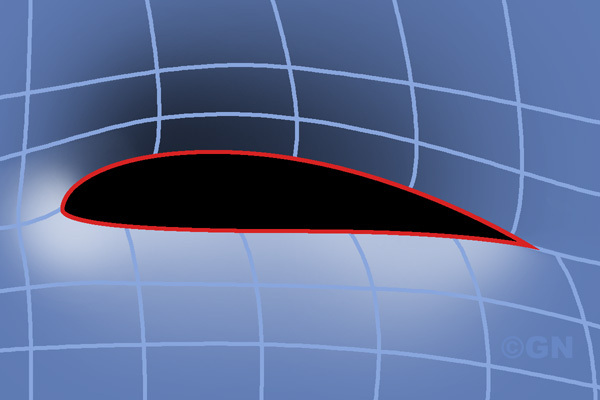 By accelerating the surrounding air mass as little as possible; slowly away from where the object is moving into, and slowly into the void the object leaves behind. How can the higher pressure area from the front move to the bottom, and the lower pressure area from the back to the top? The area of explosion should be under the wing's airfoil, and the area of implosion should be on top of the wing's airfoil. This can be achieved by tilting the cord in the design of the wing's airfoil, so that the leading edge is high, and the trailing edge low, relative to the path of the incomming air. The next illustration shows how lowering the trailing edge moves the area of implosion to more on top of the object. Newton's third law of motion: "To every action there is always an equal and opposite reaction". The wing's airfoil accelerates the surrounding air, and because the goal of the wing is a force up, the final direction of the accelerated air, should be down. The trailing edge should point a bit down, not horizontal. When a jet of air is blown over a curved surface, it will 'stick' to that surface. This jet 'swallows' air from the boundary layer inbetween the jet and the surface into its path, creating an area of lower air pressure. The pressure of the surrounding air pushes the two together. Because air has mass, it will resist against the acceleration of changing direction, but the lower pressure inbetween can keep the flow attached to the path of the solid surface. This is known as the coanda effect. In front of the wing is an explosion, and on top-back of of the wing is an implosion. The air from the explosion rushes to the area of implosion, creating a jet of air, over a curved surface! The coanda effect is very much at work on top of a wing. To increase the strength of this effect, more of the explosion should be on top of the wing, so all that air can flow towards the area of implosion with great speed. The speed of the air on top of a subsonic wing can sometimes become supersonic, relative to the wing. Placing more of the explosion on top seems wrong, but it feeds the coanda effect, and that air will go down in the end, to please Newton. - What happens at the wing tips? Vortices! - What happens when a wing stalls? - What about these flaps and slats? - How do delta wings work? Totally different! - How to design wings for supersonic flight? An illustration of an airfoil, showing (imaginationary-) air parcels around it. The air on top of a wing is accelerated backwards and downwards. The air on the bottom of a wing is accelerated a bit downwards and a bit forward.